ROB O’NEAL/The Citizen KOTS is comprised of trailers and quonset huts and is funded by the city of Key West, Monroe County and private donors. The Monroe County Commission agreed to give the city of Key West a one year extension to move the homeless shelter off the Sheriff’s Office property on Stock Island. Last September, the County Commission gave the city a year to move KOTS (Keys Overnight Temporary Shelter) off the Sheriff’s Office headquarters and jail property because Sheriff Rick Ramsay wants to place 32 units of housing for his workers there. In the past 10 months, the city has struggled to find a new location for KOTS. The city initially proposed moving the shelter to a piece of property on College Road, but the city plans to use that property only for affordable housing. Earlier this year, Mayor Craig Cates asked the County Commission to move KOTS to the Bayshore Manor senior housing property on College Road and move those residents to a senior care facility currently under construction at Poinciana Plaza in Key West. The County Commission rejected that proposal. Scholl reminded the Commissioners that the sheriff and the county have to work with the city on the sheriff’s housing project. The sheriff’s property falls within Key West limits and the city has to not only approve the project, but also a re-zoning, future land use map and comprehensive plan change, and height limit change. Until the city finds a new KOTS location, the city would be willing to work with the sheriff to house his employees on the city’s proposed 104-unit workforce housing project on College Road on Stock Island, which is currently in the planning stages. The city would be willing to give the sheriff’s employees a “priority set- aside,” Scholl said. Ramsay said he could support an extension but it has to be for a finite period of time. The Sheriff’s Office is struggling to fill open positions, he said. The Marathon jail has been closed since before Hurricane Irma because the sheriff does not have enough employees to staff it. The sheriff’s office currently has 50 vacant positions including 11 patrol deputies, 16 corrections deputies and two Trauma Star pilots, Ramsay said. Ramsay has secured $1 million in funding from the Salvation Army and has a “verbal commitment” from Habitat for Humanity to build roughly 32 apartments, he said. He is concerned that extending the lease indefinitely would impact those commitments, he said. The County Commission voted unanimously to the one-year extension, but wants a monthly progress report from the city and county staff. Commissioner Danny Kolhage called moving the shelter a “difficult thing to do” and reminded his fellow commissioners about the impacts on county owned property within the Key West city limits before KOTS existed. People were camped out on Higgs Beach and sleeping on county owned property near the airport. “County property was affected by the homeless,” Kolhage said. City of Key West officials will formally ask the Monroe County Commission for an extension to move the city’s homeless shelter, as plans for its future remain up in the air. Moving the Keys Overnight Temporary Shelter from Monroe County Sheriff’s Office headquarters and jail on College Road on Stock Island has been a priority for years, but no firm plans can be executed before the county’s Sept. 27 deadline to move the facility, according to City Manager Jim Scholl. “We still have options but we won’t have them anywhere near ready to go in time for the expiration of our limit with the county commission,” Scholl told city commissioners Tuesday. Even before the county gave the city a one-year deadline, the city was obligated to move the facility, stemming from a settlement agreement from a 2011 lawsuit filed by the Sunset Marina condo association alleging that KOTS “constituted a public and private nuisance.” The agreement was signed in December 2013. The city previously planned to move KOTS to the former Easter Seals property on College Road, but is using the 2.62 acres of city-owned property there for an affordable housing project cited as an urgent need in the wake of Hurricane Irma. In February, the county commission declined to move forward on a proposal to move the homeless shelter to the Bayshore Manor senior living facility and move its 16 residents to the soon-to-be-opened Poinciana Gardens Senior Living facility in Key West. There will be two items concerning KOTS on the Board of County Commissioners July 18 agenda. One will discuss building housing at the location and another will discuss the termination date for use of the facility, according to County Administrator Roman Gastesi. How the board will vote is unclear, but county officials feel a shelter is needed somewhere and want to work with the city and Sheriff’s Office to reach a solution, Gastesi said. The clock is ticking for the relocation of Key West’s homeless shelter and while city commissioners agree where the facility shouldn’t go, where it should go remains a mystery. The city is overdue to move the Keys Overnight Temporary Shelter, currently located on Monroe County Sheriff’s property on College Road, stemming from a 2013 agreement with the adjacent Sunset Marina condo association. Last October, the county also set a year deadline to move the facility, which Sheriff Rick Ramsay has long desired. Mayor Craig Cates led a discussion at Tuesday’s commission meeting to gauge whether board members would like to move the facility to one of three parcels slated for an affordable housing project on College Road. The board agreed it shouldn’t be installed next to workforce housing and the county should work with the city to solve the problem they share. Board member Clayton Lopez said homeless traverse the entire Keys and equated the region to a thermometer with Key West at the bottom. “We’re at the bulb of that thermometer holding all the mercury,” Lopez said. Billy Wardlow said the facility should either stay where it is or be relocated to Bayshore Manor and move those 16 residents to the soon-to-be-opened Poinciana Gardens Senior Living facility in Key West. The Monroe County Commission declined to pursue that option last month. Sam Kaufman said the county should be approached without specifics, Margaret Romero suggested looking at viable county property, and Jimmy Weekley said it is tough to make a location decision until after the public referendum to raise height limits for the affordable housing project is decided, which will occur Tuesday. Romero offered Little Hamaca Park and the dog park on Trumbo Road as potential sites, but Cates said specific locations will be discussed later and the point was to gauge board interest in moving the facility to the College Road parcels. Monroe County Mayor David Rice agreed the city and county share the homeless problem and said he would be happy to discuss the situation with city leaders. “I think that the county and the city should take a shared responsibility for essentially the cost … of providing the things that are necessary to deal with the homeless issue,” Rice said. The two sides need to look at the issue holistically, as the county currently covers medical and jailing costs of homeless and has provided a site for the shelter, while the city maintains the facility, Rice said. “We haven’t looked at it as a whole issue,” he said. The city needs to find a solution quickly as the October deadline looms, according to Rice. An investigation by the Southernmost Homeless Assistance League (SHAL) into mismanagement charges against its former executive director found no truth to the accusations, according to Rick Casey, the new chairman of the organization. Casey and newly-named interim Executive Director Elicia Pintabona appeared before Key West City Commissioners on Jan. 17 to respond to charges made by Mike Tolbert, the former director of the Keys Overnight Homeless Shelter (KOTS), who was fired in September for reopening the Stock Island shelter after Hurricane Irma without Miller’s approval. Tolbert had written a letter to city officials accusing Miller of multiple issues including mismanaging money allocated to purchase bus tickets for homeless residents to leave the island, unsanitary food preparation areas and unhealthy living conditions for residents. City commissioners voted in November not to formally investigate Tolbert’s charges but asked the SHAL board of directors to look into the claims. At the Jan. 17 commission meeting, Casey said a SHAL executive committee “conducted a complete review” that included interviews with Miller, Tolbert and an unscheduled site visit to KOTS, the city’s homeless shelter on Stock Island which SHAL has managed for the past five years. The executive committee then met two more times to come to a conclusion. Casey said Tolbert’s allegations fell into three categories, including Tolbert’s personal opinions about KOTS operations, “exaggerations,” and claims that lacked support or specifics. As to the most serious charge made by Tolbert, that Miller misappropriated funds that were to be used to purchase one-way bus tickets for any KOTS client that wished to leave Key West, Casey said it was “absolutely, utterly false.” He said the annual audit done of KOTS financial operations made its regular report this fall and found nothing illegal or irregular. “Our review included no irregularities and a copy was provided to the city. Their review indicated no irregularities,” Casey told Konk Life. Although SHAL’s investigation cleared Miller, city Commissioner Sam Kaufman still put some hard questions to Casey and Pintabona at the meeting. Kaufman pointed to a reported 17 cases of scabies, a painful skin disease, at KOTS, asking Casey to assure the city that a similar outbreak will not occur again. But Casey said he could not give that assurance. KOTS cannot track specific health issues of its clients because of medical privacy laws, he said. Kaufman also asked that KOTS develop new protocols to inform city officials and the police department when a homeless person who has accepted bus fare returns to Key West. Under the KOTS rule, if a person who has accepted a one-way bus ticket comes back, he or she cannot stay at KOTS or receive any SHAL services. Currently, there is a list of 340 people who fall into that category. Approximately 19 have returned to Key West and asked SHAL for help, Pintabona said, which SHAL has sometimes given out of compassion. But Kaufman worried that if SHAL was not informing the Key West Police Department about former SHAL clients who had been banned from KOTS but returned to the city, there could be legal issues. By law, if a homeless person has been banned from KOTS and other local social service organizations, they cannot be arrested for sleeping outdoors, even in public places. “There are arrests that are being made that may be unlawful because the Key West Police Department doesn’t know that person can’t return to KOTS,” Kaufman, a lawyer, said, adding that he had defended one such person. Pintabona said she would be reviewing SHAL’s policies as part of her new job as interim executive director, including implementing some type of appeals process for clients banned from KOTS. She also said she hoped that the new management at SHAL would help the organization repair its relationships with the city and other area homeless assistance organizations. Key West’s overnight homeless shelter is deteriorating but it remains a safe, clean place for men and women who have no other place to sleep, according to City Manager Jim Scholl. He made the comment in the face of allegations of unfit conditions from an employee who was fired during the Hurricane Irma disaster. The shelter, owned by the city, is managed by the nonprofit Southernmost Homeless Assistance League for about $440,000 a year. On a recent visit to the Keys Overnight Temporary Shelter, 5537 College Road, the shelter was properly stocked with blankets on a cold night and they were clean, he said. The city is saving any money it would spend on KOTS for a new shelter. For years, the city has been saying it would relocate the shelter to another site on College Road to settle a lawsuit filed by nearby condo owners who don’t want it next door. Monroe County Sheriff Rick Ramsay has said it’s time for KOTS to move from county property next to his headquarters. “It’s a fairly Spartan environment out there but it’s safe and when I’ve been out there it’s reasonably clean and functional,” Scholl said. The shelter director was fired during the aftermath of Hurricane Irma. Mike Tolbert said he opened the shelter against the opinion of then-SHAL Executive Director John Miller and that’s why he was fired. Miller, who held the job for four years, would never discuss the issue publicly. He recently resigned and is leaving the Keys. That decision was made months ago and is not related to the investigation, said SHAL’s board chairman, Rick Casey. Casey said the board took the allegations very seriously but after a complete review, including an interview with the fired employee, Tolbert, they all were determined to be false. The allegations were from a disgruntled employee who had been fired, he added. City Commissioner Sam Kaufman said SHAL had never shared its policy with the city about barring people who have been given a free bus ticket out of the Keys. Such people sign a form saying they won’t return to use the shelter. SHAL said of about 263 people on its voluntary relocation list from 2014 to now, 19 returned and were given some services, including a pregnant woman. About 20 homeless people are on a suspension list for misbehavior, she said. A long-awaited report on the city’s homeless shelter Wednesday evening answered some questions, but prompted others at the Key West City Commission meeting, where elected officials ultimately agreed to move forward with the new leaders of the Keys Overnight Temporary Shelter, which is run by the Southernmost Homeless Assistance League. Rick Casey, chairman of the SHAL board, presented a report and answered commissioners’ questions about prior allegations and accusations about the shelter that had come from a terminated former employee. Casey said that an independent audit and review of the shelter’s finances showed that claims of financial mismanagement and misappropriation are patently false. Kaufman said was unprecedented and too high. Although Kaufman wanted assurances that it would not happen again, Casey found support from other commissioners, who agreed that the skin ailment is easily spread in crowded areas. But interim executive director Elicia Pintabona assured the commission that KOTS is now requiring users to shower before entering each evening. “Now that the soup kitchen is providing us with meals, we’re able to require clients to shower before entering the facility each night,” Pintabona said, adding that all blankets and linens are properly washed with germicide. One of Kaufman’s other concerns involved a list of people who had allegedly been banned from the shelter. Kaufman said his list showed 380 people had been banned, while Casey and Pintabona said the actual number was 25 people, five of whom are currently incarcerated. People can be suspended from KOTS for varying amounts of time for rule violations that include violence, fighting and introduction of contraband such as alcohol or drugs into the facility. The longer list to which Kaufman was referring, Pintabona said, was a relocation list of people who had accepted a free bus ticket from SHAL to leave the Florida Keys. In accepting those bus tickets, the recipients agree they will not utilize the services of KOTS if they return to Key West. “We were snowbirding people,” Pintabona told the commission, meaning SHAL was paying for bus tickets for people who would return again and again when the weather elsewhere got cold. Commissioner Margaret Romero said she had no problem with SHAL attaching such conditions to the free bus tickets they provide. “I’m encouraged by what I’m hearing here tonight,” she said. Kaufman agreed to pursue a positive working relationship with the new shelter managers, but emphasized the importance of keeping Key West Police and Monroe County Sheriff’s Office “in the loop” with regard to suspended individuals and those on the relocation list. Pintabona assured him she would do that, and added that KOTS doesn’t turn away a client who is brought to the shelter by a law enforcement officer. In other City Commission activities…. Southernmost Homeless Assistance League Executive Director John Miller has resigned from his position and will be replaced by Interim Director Elicia Pintabona, who was previously Deputy Director. Miller is leaving the Keys to pursue other opportunities and the decision has nothing to do with allegations of mismanagement at Key West’s homeless shelter, which SHAL will address at Wednesday’s City Commission meeting, Pintabona said. The agency, which manages the Keys Overnight temporary Shelter, will address claims of former employee Mike Tolbert who said the facility misused funds, had unsanitary food preparation and unsafe conditions under Miller’s watch. The presentation has been delayed twice, most recently due to a scheduling error by City Manager Jim Scholl. Pintabona started her SHAL employment as a case worker and was promoted to Outreach Director before taking over as Deputy Executive Director. She has a background in municipal government and studied psychology, according to a press release. Miller, who served as director for four years, drew scrutiny from City Commissioner Sam Kaufman in 2016 for expanding the scope of programs at KOTS, outside the guidelines that mandate a place to sleep for the city’s destitute. Miller’s budget included $14,600 in funding for a Housing First program and $6,000 for an off-site satellite office. The agency would like to keep and expand other programs in the community going forward, but those decisions rely heavily on grant funding, Pintabona said. Pintabona, who said she is “deeply rooted in the community and organization,” will pursue the Executive Director position permanently and said she is excited to continue SHAL’s mission. Miller was not able to be reached for comment. Southernmost Homeless Assistance League (SHAL) is accepting applications for the Executive Director position. 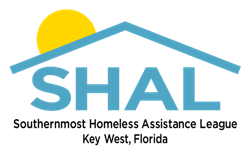 SHAL is a provider of shelter, case management and associated services for homeless people in Monroe County in support of their eﬀorts to become self-suﬃcient. A complete Executive Director job description is below. Please send resumes to the attention of SHAL board chair Richard Casey at rickcaseyjr@gmail.com. Will be responsible for maintaining current bank account signature authorizations and the bank line of credit. Developing and supervising the implementation of the SHAL budget and ensuring compliance with the budget estimates. Developing cooperative arrangements with other service agencies to leverage resources and improve the care of homeless people.